System improves food safety by providing small to mid-sized producers with fast, easy-to-use, and cost effective method to detect and prevent environmental Listeria spp. 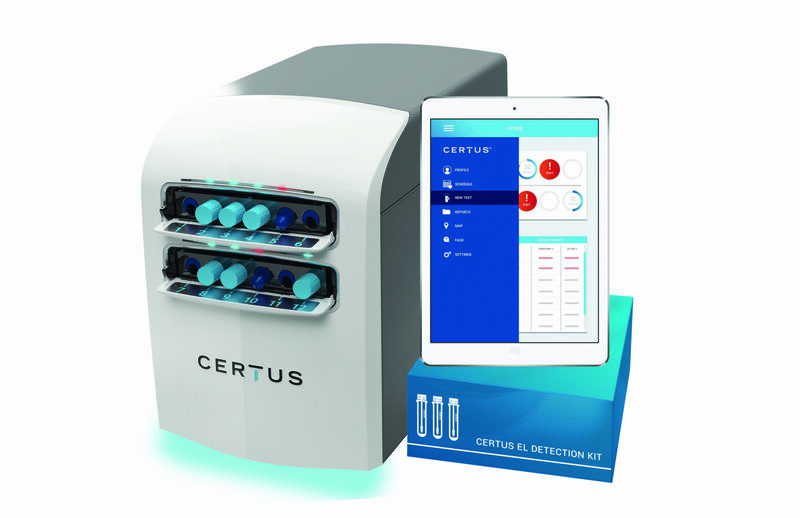 Chicago, Illinois – June 27, 2017 – Today, CERTUS™, innovators in food safety technologies, announced entry into the food safety industry with the launch of the CERTUS System for rapid pathogen detection and environmental monitoring. The CERTUS System raises the bar with a unique bio-contained, in-house solution for pathogen detection for small and mid-sized food processing plants. Unmatched in its unique approach to an industry dominated by outsourcing or complicated in-house testing, this system will make food safer by providing producers fast, easy and cost effective ways to detect environmental Listeria in food processing environments and the food itself prior to reaching consumers. CERTUS makes environmental testing and monitoring, which was once complex, a “Simple, Safe and Smart” process, greatly reducing time and cost by eliminating media preparation, sample preparation, courier expense and risk of opening an enriched sample in the plant. Anyone with minimal training will simply swab a surface, add media to the Bio-LockTM Detection Tube, and insert the tube into the CERTUS Detection Unit to start getting rapid results during the enrichment cycle. There is no need for centrifuges, incubators, pipettes, stomachers, bags and many ancillary items and steps that current methods require. The company’s patented Grow, Read, Detect™ continuous monitoring process combines enrichment and high sensitivity detection in a homogenous, no-wash format for real-time monitoring; it eliminates complex workflow; and enables any food processor to conduct safe and easy on-site testing, receive instant alerts, and take action to remediate. The first commercial system will be launched in 2018 for environmental monitoring and prevention of Listeria spp.